Battlestar Galactica Swap Part Two! | Stitch, Brinn, Stitch! Battlestar Galactica Swap Part Two! 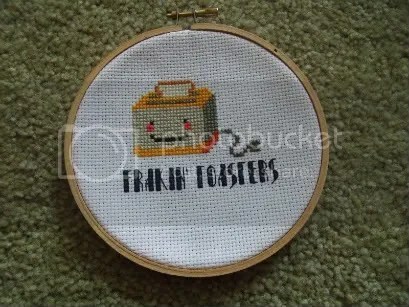 A sweet embroidery with a cute lil toaster. : ) Frakkin’ Toasters! 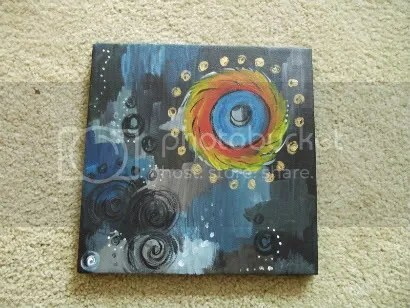 An AWESOME painting inspired by Starbuck’s paintings. 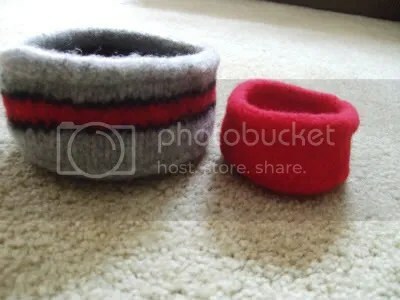 And two felted bowls, inspired by the Cylon Centurions and Caprica Six’s red dress (which, btw, I totally love). The larger Centurion bowl will be perfect for a key bowl to keep by the door of my apartment next year, and the smaller one will probably hold odds and ends around my craft space. Just a by the way, you have 3 pictures of Frakin’ Toasters 🙂 and they are very cute indeed! Grah, yes, I’d noticed that. It should be fixed now. Hee! I love the frakkin’ embroidery!